Our gorgeous Beatrice statement pearl cascade wedding Necklace is a flamboyant pearl necklace design which is handmade with beautiful 6x4mm oval shaped, ivory freshwater pearls on silver wire. 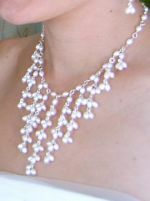 The freshwater pearls cascade beautifully across your chest making this piece of wedding jewellery really eye-catching. 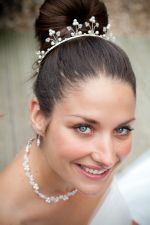 Our brides deserve the very best so we insist on using real freshwater pearls! Each freshwater pearl is truly individual and no two pearls are exactly the same. Beatrice bridal necklace is adjustable between approx 16-18 inches in length and fastens easily with a sterling 925 silver lock. The depth measures approx 3 inches at its longest point. If you love this wedding jewellery item but are looking for a different style or colour we do offer a jewellery bespoke service. This item is handmade to order especially for you: please allow 1-14 days for delivery. We can prioritise your order if you need it urgently, please let us know the date you need this item on your payment page.